Taxi! Chinese Company Finds Fair Deal In London Cab Maker : The Two-Way The iconic black cabs of London got a lift Friday when a Chinese company rescued the British automaker that manufactures the taxis. Black taxis drive down The Mall in London. 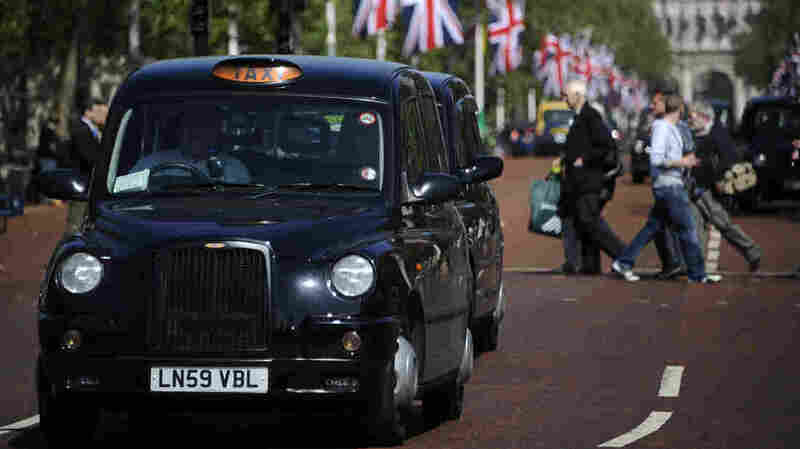 A Chinese company rescued the British automaker that manufactures the famous cabs. The iconic black cabs of London got a lift Friday when a Chinese company rescued the British automaker that manufactures the taxis. Zhejiang Geely Holding Group said it will pay $17.5 million to buy Manganese Bronze Holdings, which has been making the cabs since 1899. "We are delighted to have completed the acquisition of MBH's business and we are determined to restore the fortunes of this totemic marque which is known, recognised and admired all around the world," said Li Shufu, group chairman at Geely, according to The Telegraph. Last year, Manganese had to recall 400 of its newest vehicles after a mechanical defect was found, leaving hundreds of cabbies unable to ply their trade, as Vicki Barker reported for Weekend Edition Saturday. The company went into administration — a form of creditor protection — on Oct. 30, Bloomberg News said. Prior to that, Manganese had 274 workers. That number has fallen to 107 employees. According to The Guardian, "Manganese traces its roots to the 19th century when it made ship propellers. Its London Taxi Company division makes about 2,700 cabs a year and has produced more than 100,000 since its launch in 1948. Its newest model, the TX4, was launched in October 2006." Friday's news was widely hailed in London. "London black cabs survive ... thanks to the Chinese: Firm behind Capital's iconic taxis saved from extinction by car giant in China," The Daily Mail's Web headline cheered. London Mayor Boris Johnson also welcomed the deal, The Guardian reported. "I am delighted that Geely has successfully secured the future of the London Taxi Company, ensuring the continuing manufacture of a world famous, fully accessible and instantly recognisable vehicle synonymous with London," he said. Geely had already owned a 20 percent stake in Manganese and is perhaps best known for rescuing Volvo, another European auto icon.